Team Sky boss Sir Dave Brailsford has told other teams to follow their example and release performance data of leading riders. 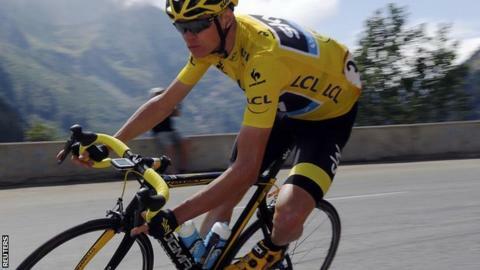 Sky's two-time Tour de France winner Chris Froome published physiological test results after being dogged by doping speculation during his 2015 win. The results suggested he was capable of his performances without cheating. Welshman Brailsford has written to the sport's governing body to suggest other teams go through the same process. "It should be standardised," said Brailsford. He argued that if the teams agree to the same "disclosure model", then it "takes away the discretionary decision". Brailsford said that he has received cautious encouragement from Brian Cookson, head of governing body the UCI, who thinks it is "worth discussing". Other riders, including Giant-Alpecin's Tom Dumoulin, have also voluntarily released data, but Team Sky have come under the most scrutiny. At last year's Tour, Froome had urine thrown at him by a spectator and was apparently spat at after the legality of his performance was questioned on French television. Brailsford insisted that, while the results can be open to interpretation, independent testing has symbolic value as well. "As a general action or thought, the intent to be as transparent as possible is a very good thing," he told BBC Sport. "I don't think anybody can criticise that. "The fact that it was independent from the team - so we could not influence the results - was very healthy, too, and I was fully supportive of that."